May 1, 2009: The Third Edition of Preferred Stock Investing is now available! Chapter 15 lists all 153 qualifying preferred stocks that have been issued since January 2001 and shows you how you would have done by using the investment method described throughout the book for each one. And the book includes all of the websites and other resources that are used to implement the CDx3 Income Engine on your own. The Third Edition of Preferred Stock Investing is my most comprehensive work yet and it is now available at your favorite online retailers (see retailers). In addition to the new book becoming available, there is an awful lot of ground to cover this month. On April 10 Time Magazine declared that the banking crisis ended on March 5, 2009. The Last Month's CDx3 Investor Results article presents data that suggests that Time may be right. My long-reported contention that 32 specific CDx3 Preferred Stocks from fifteen specific banks are going to lead the way is supported in spectacular fashion as the market prices of these 32 CDx3 Preferred Stocks are up 68% over just the last two months. Since writing my first preferred stock research paper in 2003 I have made a commitment to providing you with the latest research regarding the market price behavior of the highest quality preferred stocks. I always write in plain English for non-experts. The Special Announcement article announces the availability of the all new, completely rewritten Third Edition of Preferred Stock Investing (see retailers). The article also describes what appears to be the first-ever use of web "blog" technology by a group of several dozen readers and subscribers to help the author of an investment book finalize a new manuscript. In the CDx3 Company Spotlight article I introduce you to Vornado Realty Trust, issuer of CDx3 Preferred Stock. In addition to owning almost 60 million rentable square feet of commercial property throughout the U.S. and Puerto Rico, Vornado is also 1/3 owner of Toys R Us. I present Vornado's Q1/2009 financial results in this article. The CDx3 Question of the Month shows you the four things that preferred stock investors should look for in order to identify preferred stocks that are at the point in time when their market price is most likely to favor buyers during "buyer's market" economic conditions (now). A sample "CDx3 Bargain Table" is provided that lists 30 CDx3 Preferred Stock as examples. I am committed to making certain that readers understand how the CDx3 Income Engine (the preferred stock investment method described throughout my book, Preferred Stock Investing) is being used during this credit crisis. In the Free Special Offer article below I am providing you with a free downloadable copy of my Quick Guide To Preferred Stock Investing During A Global Credit Crisis. This Quick Guide provides you with a summary of how to use the highest quality preferred stocks to earn above average dividend income while simultaneously creating multiple downstream capital gain opportunities. Subscribers to the CDx3 Notification Service have received the news, tips and tools that have been needed to navigate this Global Credit Crisis. Subscribers knew which banks to avoid and have been rewarded with 100% of their preferred stock dividends paying on time and in full. Please consider subscribing to the CDx3 Notification Service. The SEC is due to clamp down on "predatory short-sellers" and, frankly, it couldn't happen to a more deserving group. I have posted an article (May 5, 2009: Preferred Stock And Short-Sellers) regarding this activity on the new Preferred Stock Investing Reader's Forum that explains what the SEC is working on. This long-overdue move is hugely positive for preferred stock investors starting this month. I will report back to you in next month's CDx3 Newsletter. Time magazine, our official maker of entertaining declarations, announced on April 10 that the banking crisis has ended. More specifically, Time said that the bottom occurred when Citigroup’s common stock fell below $1 per share which was on Thursday, March 5, 2009. Our collective migraine, says Time, has been on the mend ever since. And I have to agree that the recovery that we have seen, particularly in banks since early March, has been nothing to sneeze at. I have written to you since last fall that as the recovery in financials starts we are likely to see it first in the market prices of the 32 CDx3 Preferred Stocks from the The Protected Fifteen CDx3 banks. Like sunbathers easing back into the ocean for a dip a week or so after a shark sighting, when economic recoveries kick in, we typically see investors pull money out of safe haven holding places (such as gold) and put it into the next best thing up the risk ladder – corporate bonds and the highest quality preferred stocks. Not being clairvoyant, I do not know if Time has it right or not (and neither do they). But there is also no denying that since March 5, 2009 we have in fact seen massive amounts of investor cash come out of hiding places like gold, despite longer-term inflation fears. After exceeding $1,000 per ounce in late February, gold is now selling closer to $900. And brokerage firms reported at the end of February that a record amount of new cash had come into client accounts, staged for making new purchases. 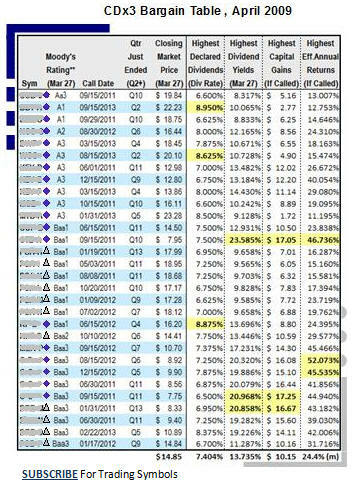 My position since last October has been that the highest quality preferred stocks offered by the top fifteen TARP banks (what I refer to as "The Protected Fifteen") will be among the first places that investors will turn to when a real recovery gets under way. Take a look at what has happened to the market prices of the 32 CDx3 Preferred Stocks from The Protected Fifteen banks that I have been telling you about since Treasury implicitly protected these banks with last October's TARP program - up a whopping 67.96% since March 5. Since early March a staggering amount of investor cash has come out of gold and other safe havens and into these 32 CDx3 Preferred Stocks issued by The Protected Fifteen CDx3 banks. If these 32 issues are not signaling that the long-awaited recovery in financials is under way, it is not clear what other signal we should wait for. And here’s the best part. These 32 CDx3 Preferred Stocks are not done yet. The depths of the Global Credit Crisis pushed their market prices down so far that, as impressive as the 68% price increase over the last two months is, these issues still have a lot of upside potential left. What I mean by upside potential is that, as the economy recovers over the next couple of years, the market prices of these 32 CDx3 Preferred Stocks are likely to continue upward by a very specific amount that we can actually calculate. If they do so, you would be in a position to sell for a downstream capital gain, on top of great dividend income in the meantime. Here’s a simple calculation that shows us the remaining upside potential of this group of 32 CDx3 Preferred Stocks. As a group, they have an average declared annual dividend rate of 7.41% and their current (May 5, 2009) average market price is $16.68 (that’s an average annual dividend yield of 11.11% for this group). So if you were to purchase this group today, you would pay $16.68 per share on average. As the economy recovers over the next couple of years, declared dividend rates being offered by new CDx3 Preferred Stock issues will fall off of their current historically high 8.95% average toward a more normal 7% or so. 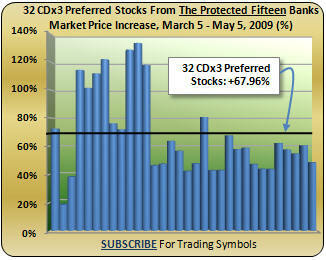 Remember that new CDx3 Preferred Stocks are always introduced at a market price of $25 per share. To calculate the remaining potential capital gain of this group we therefore need to answer this question: If a CDx3 Preferred Stock with a 7% dividend sells for $25, what market price will 7.41% (this group’s average declared dividend) sell for? Answer: $26.46 per share. ($25 x 7.41%) / 7%. In other words, as dividend rates fall back to a more normal 7%, this group will yield 7% when its average market price rises to $26.46 per share. Today, you can buy a share of this group for an average market price of $16.68 per share. Buying now for $16.68 and selling downstream for $26.46 delivers a $9.78 per share (potentially another 58%) capital gain to you for this group of 32 CDx3 Preferred Stocks from The Protected Fifteen banks in the event of market normalization. How do you position yourself to take advantage of it? Subscribers to the CDx3 Notification Service receive their own monthly newsletter called CDx3 Research Notes. Along with real-time results of my ongoing preferred stock research, the trading symbols for these 32 CDx3 Preferred Stocks from The Protected Fifteen CDx3 banks are listed in every issue. To ride the recovery wave in financials with the highest quality preferred stocks, you should consider subscribing to the CDx3 Notification Service. We do all of the research and calculations for you and you receive an email message when there is a buying or selling opportunity coming up for the highest quality preferred stocks. I'm happy to report to you that the Third Edition of Preferred Stock Investing went on sale on May 1, 2009 (see retailers). The new edition adds 70 pages and five new chapters and includes all of my new research and lots of new data regarding how to screen, buy and sell the highest quality preferred stocks. Real CDx3 Preferred Stocks are used throughout the book to illustrate the key points (see Table of Contents). The Third Edition of Preferred Stock Investing lists every qualifying preferred stock that has been issued since January 2001 and, as a reader, you will receive free periodic updates to the lists in chapter 15 (instructions are in the new book). But here's the coolest part. Several dozen readers and subscribers helped me write this edition of Preferred Stock Investing! People just like you - preferred stock enthusiasts. After querying my publisher, reading several books and making other inquiries this is probably the very first time that web technology (in the form of a "blog") has been used by a group of people to polish up the manuscript of an investment book. About half of the Review Team included full-time, part-time and retired members who either were, or still are, brokers or financial planners. And the other half was made up of individual investors, some with many years of preferred stock investing experience and some passionate beginners who are anxious to purchase their first CDx3 Preferred Stock. Thanks again to the PSI Review Team! Vornado Realty Trust is a $7.1 billion commercial real estate company and 1/3 owner of toy retailer Toys R Us. Vornado, headquartered in New York City, owns 111 office properties (34 million square feet) and 177 retail properties (22 million square feet) throughout the U.S. and Puerto Rico. On April 21, 2009 Vornado announced its first quarter 2009 financial results. After adjusting for one-time activity differences between the same quarter of 2008 (such as Vornado's March 31, 2008 sale of its 47.6% interest in Americold, a cold storage company), Vornado's Funds From Operations (FFO) improved from $1.61 per share in 2008/Q1 to $1.70 per share in 2009/Q2. FFO is a metric used by real estate companies that reflects their operating performance and is a better indicator of the company's cash-based performance (the calculation adds depreciation and amortization back into earnings). Also on April 21, 2009 Vornado announced a new common stock offering valued at $617 million in new cash for the company. The Global Credit Crisis has been tough on everybody and commercial real estate companies are certainly feeling the pain as well. On April 7, 2009 Vornado completed a $75 million financing deal of its fully-leased 4 Union Square Manhattan retail property that was previously owned free and clear. Vornado is an issuer of CDx3 Preferred Stock. Since new preferred stock issues have been slow this year, is there anything to buy? Beth C.
My research documents the methods for adding CDx3 Preferred Stocks to your portfolio under different economic conditions, during a "buyer's market" (now) or during a "seller's market." During a seller's market for CDx3 Preferred Stocks (which is the vast majority of the time, historically) CDx3 Investors purchase CDx3 Preferred Stocks when they are first introduced to the market as explained within chapter 11 of Preferred Stock Investing. Even with the ten CDx3 Selection Criteria eliminating about 90% of new preferred stocks leaving just the highest quality issues, new CDx3 Preferred Stocks are still historically introduced at a rate of about one to two per month so there is always plenty to pick from. During a buyer's market, as dividend rates rise making new issues more costly to issuing companies, there will be fewer new issues so CDx3 Investors use the "CDx3 Bargain Table" to identify purchase candidates (Preferred Stock Investing, chapter 10). The CDx3 Bargain Table is created each month and identifies CDx3 Preferred Stocks that are at a point in time that, my research shows, tends to favor buyers. Specifically, these are CDx3 Preferred Stocks that are (1) more than two dividend quarters old, (2) have yet to reach their call date, (3) are just starting a new dividend quarter and (4) are available for less than $25 per share. The April 2009 example presented here was sent to subscribers on March 28. You can see that CDx3 Preferred Stocks are all rated "investment grade" (Baa3 or higher). Knowing when market prices will tend to favor buyers is the real trick and, as you can see in this example, a lower market price means that your yield (the annual return that you make on the money that you actually have invested) goes up. The average annual yield (see the column labeled Highest Dividend Yields) for this group of CDx3 Preferred Stocks from April's CDx3 Bargain Table was a very respectable 13.735%. It pays to know when to consider buying. The CDx3 Bargain Table is produced each month and, from all of the CDx3 Preferred Stocks trading on today's market, identifies the specific issues that meet these four criteria. For the do-it-yourselfers, Preferred Stock Investing explains exactly how to produce this table. Otherwise, the CDx3 Bargain Table is provided to subscribers to the CDx3 Notification Service in each monthly issue of the subscriber's newsletter, CDx3 Research Notes. CDx3 Preferred Stocks from banks (blue diamond) and non-banks (grey triangle) are also identified for subscribers along with their current Moody's rating and other information for each issue (the trading symbols have been removed from the image here to protect subscription values). Thanks to Beth C. for the great question. You will receive a free copy of the CDx3 Special Report "Dividend Accounting." The 22-month long credit crisis has shaken our financial system and everyone who is invested in it (which is just about everyone). Even though the CDx3 Selection Criteria, day after day, have successfully filtered out the preferred stocks from every failed bank for almost two years now, and even though there has not been so much as a missed dividend for those who have invested in CDx3 Preferred Stocks, there's still some anxiety. On April 24, 2009, after meeting with bank leaders to discuss the stress test results, Federal Reserve officials held a press conference and, as they have intimated many times since last fall, specifically stated that these banks will not be allowed to fail, even if they fare poorly on the tests. Throughout May there will be much discussion regarding the handful of big banks that are going to need to raise more capital. The bulk of the discussion is going to be about the conversion of government-held preferred stock shares to common shares. This will put the U.S. government in the odd position of being a partial owner of a business that they regulate - the ultimate conflict of interest. Having a large ownership position in a bank that they regulate exposes the government to all sorts of liability and other such claims ("...whose interests are you serving anyway?!..."). I do not share the "nationalization" fears that many in the financial press seem to look forward to dwelling on. Uncle Sam is not, nor have they claimed to be, well suited to run a for-profit operation. Finding themselves in such a position is an unnatural outgrowth of this nasty credit crisis that, I believe, officials will seek to extricate themselves from at the earliest opportunity. Focusing on issues such as executive bonuses day after day is not what it takes to operate a profitable business and I think that all involved know it as well as I do. Of much more importance to preferred stock investors is the current SEC forum regarding putting some rules in place to thwart 'predatory short-sellers.' New rules are due in late-May or early-June and are going to be very positive for preferred stock investors. I have posted an article (May 5, 2009: Preferred Stock And Short-Sellers) regarding this activity on the new Preferred Stock Investing Reader's Forum that you should take a look at. The SEC is about to turn the screws on the dishonorable conduct of this group and preferred stock investors will be much better off for it for many years to come. As the new restrictions on predatory short-sellers become known I will report back to you in next month's issue of the CDx3 Newsletter. Learn to screen, buy and sell the highest quality preferred stocks by purchasing my book, Preferred Stock Investing (see retailers). The book identifies the resources that you need to be a very successful CDx3 Investor completely on your own. If you would rather we do the research and calculations for you I offer the CDx3 Notification Service.